"My little daughter got riches for soft words, but yours were always  rough of the tongue. And it's not my fault, anyhow, for you yourself sent them into the forest." Reason for Reading: read aloud to the 9yo, a story a day, every other week. Read it for research. It's a very westernized approach to Russian fairy tales. It didn't help much but it was short and got me into the "fairy tale" research mood. A childhood favourite. Still got my rather threadbare copy and still enjoy reading it. 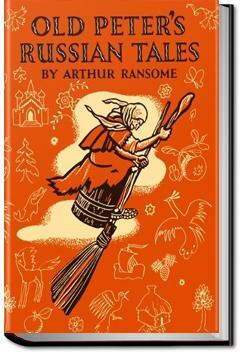 A collection of fairy tales from Russian, rewritten for English children. . . .
More than merely a collection of short stories, this book sets the mood through using the character of a grandfather (Old Peter) telling tales to his two grandchildren. In between tales, we glimpse a bit of everyday family life through events and conversations in their hut in the forest.